Trigger Point – Use to release Trigger Points (knots). Swedish Massage – Commonly used for relaxation. Pre Natal Massage - Helps ease discomfort with pregnancy, and can help prepare for labor. CDB Massage - Helps reduce pain and inflammation. Hot Stone - Helps relive chronic pain, reduce stress and encourages blood flow throughout the body. Cold Stone - Helps to reduce inflammation and swelling, decreases soreness, and encourages circulation. Scalp - Helps increase circulation to the head and face, strengthens the roots of the hair and helps to soften and condition the hair. NWA Health Solutions has two massage therapist that can cater to our patients needs and type of care that will benefit them the most. Adrian graduated from Blue Cliff College with a License of Massage Therapy. She has been practicing massage therapy for the past 6 years. Her specialty is Prenatal Massage. 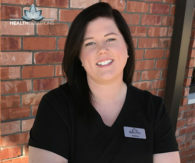 Adrian has a passion for helping patients that experience migraine and sciatic pain and because of this passion she is currently studying reflexology so that she may expand her services. Adrian’s larger than life and nurturing personality make her a great fit with our team. 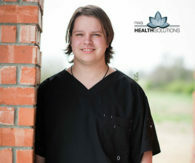 Spencer is one of our amazing massage therapists. Spencer graduated from Blue Cliff College with a License of Massage Therapy on 2017. He has been practicing massage for the past year. In this position Spencer can see real results with his patients. Working at NWA Health Solutions provides him with an opportunity to learn from the Chiropractors and help them with their patients. For Spencer the most rewarding part of being a massage therapist is getting to see the overall improvement in his patients.